Corvairs have been very successful over the years in autocross racing (also known as slalom racing or Solo 2), and I'm building these pages to help folks have more fun and success in this sport. If you have a question or would like to add or comment on what's already here about Corvair racing, please mail me. I would like to thank all the folks who have contributed so far, it really helps! For those of you who don't know who I am, my name's Bryan Blackwell, and I can usually be found in cyberspace on the Virtual Vairs e-mail list as well. Although the last few years have been devoted to our Greenbrier, I have not forgotten the red Corsa. I've started making plans and getting together some parts for a new engine. We're also going to need a new engine for the Greenbrier, so that one will be a good refresher as I haven't built an engine in quite a few years. Due to the number of pages, new pages uploaded within the last month are marked with a "new" icon like this one . Updated pages are denoted by a red bullet like this . If you're interested in helping support this site, using my links to make your Amazon.com purchases means I get a commission at no cost to you. If you're just starting out, these pages are probably where you want to look first. Choosing a class. Before you go to your first event or buy that cool new part, see what class you'll end up in. Nuts? Somebody trying to convince you this is a bad idea? Listen to Bryan instead. Event record sheet. It helps to keep track of what you've changed on the car, click to download a PDF. Wondering what to do next? Take a look at these pages. Photos of Corvairs with non-stock wheels and tires (including specs). Get an idea of what your new wheels will look like. Using 3rd generation Camaro wheels on your Corvair (or other older Chevy), by Bruce Schug. Lug pattern list, covers wheels from every make of car I've been able to find. Based on a list by Dave Williams and Bill Drake of the hotrod list. Tire deflection illustrated. Ever wonder why low profile tires work better? Or more air in a street tire? Early model anti-jacking modification. By Larry Forman. Air Filters. We need a clean supply of air to the carburetors. Otto Rotated Carb Kit install by Rick Norris. Rochester vent tube installation instructions by Chuck Armer. Fuel Injection. Tired of carbs? Here's the answer. An electric cooling fan installation and test, courtesy Bob Helt, Ken Hand, and Frank Parker. Electronic Ignitions 101 by Ray Sedman. Camshafts 101 by Ray Sedman. Oil coolers - street and track. Street oil cooler installation by Bruce Schug. Remote Sensing. Oil temp and pressure, where to put the senders. More info on the oil system. Interior. You gotta have an office to work in. Steering wheel and box interchanges. Chevy used several variations on the Corvair steering assembly, these notes cover what you can swap into your 'Vair. Shifter and transmission. The Corvair shifter is a rather complex assembly since it has to reach so far back. Here are some tips that should help you "get it in gear". I'm also putting general transmission and differential related tips here. Where to sit. You're always touching the seat, so make it more comfortable. Good seats are also a performance advantage, it's easier to drive than hang on. Details on our aftermarket seat installation into the '62 magon here. Monte Carlo seat swap. Jim Briggs did this swap into his '65 Monza, resulting in more comfortable seats that will hold you in better. Add some lightness. Everybody wants a more powerful engine - but making the car lighter will pay off in handling, braking, AND acceleration. Swap info. Engine weight info, plus some other bits on swapping engines. Modified Crown Subframe. The late Mike Hawkes designed this mod to the Crown CorvEight subframe for more space in the car. Cut the air. Ned Madsen is a Corvair enthusiast and aeronautical engineer. Here's some great info from his presentation at the 2005 Performance Workshop. Also see his Go Ned Race Team site for tuft test photos. Battery relocation. Moving the battery out of the engine compartment to the trunk is an easy way to help the weight distribution of the car. Rick Norris shared his installation into his Sunoco replica track car. Trans ratio and RPM drop table. Patrick Caherty came up with this handy table so you can see what RPM you'll end up at after each shift. I've added most of the popular modified Corvair boxes to it as well, along with what ratios are in the various boxes. Stock and SP class rules. A line by line listing of things you can do based on each rule in the SCCA Solo 2 rulebook. I've started adding some info for the Corsa autocross rules too. E/Street Prepared Stuff. This page is a summary of what I've learned about setting up my car (that's it above, at the '94 Williamsburg convention). E/SP is a class that a lot of folks find themselves in who have the usual bolt-on goodies. Yenko Stingers! You can bolt Stinger parts onto your SP class Corvair - wondering what came on a Stinger? Standard equipment and options for Stages I, II, and III. Stinger Prep Manual. In 1973, Jim Schardt prepped his Stinger to go racing, finishing fifth in the SCCA national championship race. He kept notes on what he did to the car, and he's been kind enough to let me put them up here. Great for anyone with a racing Corvair. Putnam Park Hot Lap. Also from Jim Schardt, a hot lap turn by turn tour of Putnam Park in his (now Vintage) Racing Stinger. Suppliers. You won't find the parts for your performance Corvair at every speed shop, but there are several enthusiastic suppliers who carry the goodies you'll want. Tools and parts. To finish first, first you must finish. An on the road toolbox, along with some part numbers for common wear items like plugs and fan belts. Bibliography. Here are some books which I've found useful in preparing and modifying my Corvair, along with some other titles regarding racing and other cars in our driveway. FAQ. A catchall of common questions. Bryan and Ellie's cars. Finally, here are some details on the Blackwell autocross Corvair and the others in the driveway. 1962 700 Wagon. We needed a little more space than a Corvair car normally provides, so when shopping for an early we got a wagon. Daytona 2000 Race car gallery. I went to the 2002 Corvairitis Treatment Day. The treatment didn't work, I ended up bringing home the 1966 Corsa. Always walk the course. My fun at the 2003 CORSA Convention. Photos from the 2003 CORSA Convention. If you're going to have a heater, it might as well work. 1966 Corsa coupe. Our budget fun driver 1966 Corsa coupe. 1999 Neon R/T. We needed something newer to drive, it's quite the autocross car too. Here are some neat Corvairs other folks have built. Doug Roe's 1960 Corvair coupe. 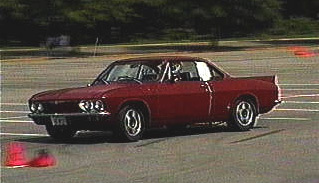 This is one of the most famous racing Corvairs ever, first owned by Bill Thomas, then Doug Roe. After a long rest out in the desert, Warren Leveque has purchased it and has brought it back to life! Rick Norris' photos from the Feb 2005 Performance Workshop at Gary Funkhouser's shop. Historical Notes. Here's a little background on the car beyond what you'll find in How to Hotrod Corvair Engines. The Ultimate Spyder. Warren Leveque's latest creation - an altered wheelbase, tube frame, mid engine, supercharged Spyder. Is it fast? You betcha! Fitch Wagon. Jeff Angelli is building something John Fitch never did - a wagon. Given that we have a wagon ourselves, this one is of special interest to me. Kent Sullivan's "Little Vair Coupe". Kent Sullivan has been building a 190c.i. powered Corvair, he has a web site with info on the car, the big bore engine, and Canadian Corvairs too. This is the car and engine which use the headers that were pictured on my site. Matt Nall has a page with a variety of technical papers, including Warren Leveque's regular autocrossing column for the CORSA Communique, Solo Is. Mike Mann's Street Terror. Have a need for speed? Here's what Mike Mann did about it! Photo Gallery. Performance Corvair photos - All Corvair, Corvair powered, or Corvair bodied, all welcome here. The Corvair Society of America. Think you're the only Corvair owner out there? Guess again! Join the club, it's the best investment you can make in your Corvair! If you're planning on attending a Corsa autocross, you can find a copy of the Corsa rules here. Virtual Vairs. The Corvair e-mail discussion list, check out the web site. All Corvair owners welcome! FastVair. This list is devoted to fast Corvairs. Check it out! Of special interest is the files section, which has photos and articles (including Warren's Solo Is columns). BTW, the list is not limited to one particular type of Corvair racing, anything fast goes! Gary Aube has an excellent Corvair site, including lots of pages for every kind of racing and performance Corvair - Yenko Stingers, Fitch Sprints, V-8 conversions, and more. Corvair Alley. Rick Norris' site includes a number of pages and photos documenting his Sunoco liveried track Corvair. Van Pershing's Corvair page. Van's site has several project pages for modifications to his Yenko Stinger clone. The Corvair Project. Eric Marschner maintains a great list of Corvair links, take a look. Team.Net. The autocross mailing list pages. The SCCA. They have pages devoted to Autocrossing (called Solo2) They have downloadable rulebooks for autocross here and Road Racing construction here. Autocross FAQ. The San Francisco region of the SCCA put up this site for the Team.Net FAQ. It has good general info on autocrossing, but is now somewhat out of date. Another good site is here. Brian Beckman's The Physics of Racing. A multi part series of articles on vehicle dynamics, I've mirrored a copy here along with PDFs you can download. Amazon.com Not exactly autocross related, but they do have listings for many racing and performance books, and they now carry tools and other things useful to the performance car hobby. In association with Amazon, I get a commission for each sale from a link here, so you can help support this site when you shop at Amazon. Below is a search box you can use to look through everything they carry. Copyright: All copyrights of original material are retained by Bryan Blackwell, all attributed material copyrights remain with their authors. Material on these pages may be used for non-profit purposes provided it is attributed. Disclaimer: I've tried to make the information on these web pages as useful and accurate as possible. However, constructing, modifying and operating a motor vehicle are all activities which have inherent dangers to both people and equipment. Bryan Blackwell and any other authors and providers of the information here do not accept any liability for any loss or injury as a result of the use or misuse of that information. Established 30 Jan 1997. Last update: 18 May 2017. Copyright 1997-2010 Bryan Blackwell.